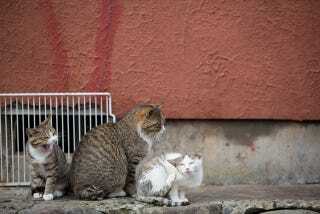 In Japan, there isn't just one cat island, but a couple. And recently, one internet commenter visited the most famous one in the country and took some lovely photos. Located in Miyagi Prefecture, Tashirojima was home to over a thousand people during the 1950s. As previously mentioned, only a few hundred people live there now, and the cats outnumber the humans. The felines were originally kept by fishermen to kill mice, preventing them from eating the silkworms used to make fishing nets. This "cat island" (猫島 or "neko shima") is even home to a Shinto cat shrine. Tashirojima has become a tourist spot because of the animals. Dogs are prohibited, and the furry critters roam free. This week, these photos appeared on 2ch, Japan's largest bulletin board, and they are some of the best images I've seen of the island.